In the mood for an authentic schnitzel? Get Schnitz delivered to your door! Established in 2001, Schnitz has since grown to over 70 stores Australia wide. This Aussie success story is renowned for serving up authentic schnitzel dishes that border on perfection. Founded by Polish-born Roman Dyduk and his two sons, Schnitz pioneered a healthier pan-cooking technique that enables the restaurant to produce a range of superior schnitty options, without compromising on taste. In fact, with all the flavour and none of the oily stuff, wny not give this joint a go? Great for the lips and a win for the hips! 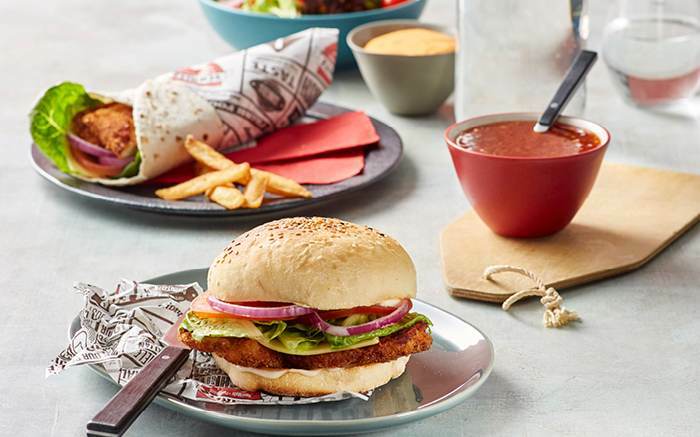 Whether you're craving a crispy chicken schnitty, a perfect parmigiana, or a scrumptious slider, Schnitz has got what you need. Happy ordering! Maybe you're lazing on the couch, keeping a glass of wine company. Maybe you have little monsters to feed. Maybe you're neither of those things, but one thing is for sure, you're not cooking. Enter Schnitz. These guys have perfected the art of schnitzel making, and the proof is in their broad range of delicious menu options. If you're craving a roll or a wrap, we recommend the Parmageddon (parma, sautéed peppers & mushrooms, fresh basil & Italian herbs). If you're down for a more traditional option, the Crumb-Free Chicken Fillet is delightful (add Moroccan spice), or if sliders are your jam, look no further than the Mini Basic Instinct (schnitzel, baby cos lettuce & Original Mayonnaise). And they get extra Menulog points for the cute names, naturally. Log onto the Menulog app or website and within a few taps your scrumptious schnitzel could be delivered right to your doorstep!